It's time for our annual Holidoobie sale, but this year it's even better. Beginning immediately and running until Saturday December 20th at 12PM New York, there's no domestic shipping on anything, plus you get a FREE CHEECH AND CHONG CD (our choice) with every order of $25 or more. Comedian Tommy Chong, known for the marijuana-themed Cheech & Chong comedies, has partnered with Reviver Clothing Swipes to launch a line of swipes designed to remove the smell of cannabis and tobacco odor on clothing. Reviver said the product helps keeps marijuana usage discreet, a need that is more relevant than ever with the growing legalization of both recreational and medicinal marijuana. "While our culture is rapidly accepting cannabis consumption as a way of life, it's fair to acknowledge that smelling like cannabis in many public settings may not be cool," Chong said in a statement. "I could have used my Tommy Chong's Smoke Swipe 10 years ago to save me from a lot of headache," he added, referring to a nine-month prison sentence he received in 2004 for shipping bongs to Pennsylvania. "Now, those who partake in it can keep it to themselves." "We are honored to collaborate with the legendary Tommy Chong," said Reviver founder and CEO Ben Kusin. "With his input, we were able to develop the ideal product that's long overdue for cannabis consumers." The swipes are portable and reusable, Dallas-based Reviver said. Customers can place a swipe on their fingers, rub the applicator across clothing to neutralize odors, and replace it into its re-sealable package. 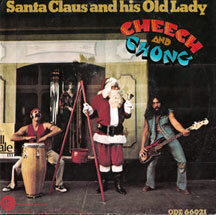 As part of the comedy duo Cheech & Chong, Grammy Award-winning Chong minted six gold records and released eight films. Chong went on to star in several films and television shows, including his regular character, "Leo" on the comedy series "That 70s Show." In 2012, Chong announced he was battling prostate cancer and decided to combat his illness with a controversial cannabis oil protocol. On July 5, 2012, he revealed that the cannabis treatment had been effective and he was cancer free. WEST PALM BEACH, FL--(Marketwired - Nov 20, 2014) - FastFunds Financial Corporation ("FastFunds" or the "Company") (OTC: FFFC) and its wholly-owned subsidiaries, Cannabis Angel, Inc., and The 420 Development Corporation, announced today that a definitive licensing agreement with Chongson, Inc. ("Chongson") regarding the production, promotion and sale of a Tommy Chong branded Cannabis GreenCard has been finalized. An extensive sales and marketing program is currently being organized with plans to roll-out the Tommy Chong Cannabis GreenCard into the market. As previously mentioned in a press release dated June 19, 2014, the Company's 49% ownership in Cannabis Merchant Financial Solutions, Inc., allows for the development and marketing roll-out of the Tommy Chong Cannabis GreenCard. The Tommy Chong Cannabis GreenCard will be initially marketed to over 1,000 cannabis dispensaries in the Colorado, Washington State and California regions. Following the initial roll-out, all medicinal and recreational cannabis dispensaries will be targeted as prospective customers of the product. The Company is organizing an extensive online presence and marketing program that will offer customers and distributors of the Tommy Chong Cannabis GreenCard the opportunity to purchase their card, reload their card with additional money, view points earned and track reward eligibility. Being able to offer a solution in the marketplace that will replace the cash-only component to the cannabis industry is expected to generate significant demand for the Tommy Chong Cannabis GreenCard. "We have made significant progress in developing a product that will benefit cannabis dispensary owners. We look forward to bringing our product to market and capturing a significant portion of this thriving industry," commented Mr. Kurt Martig, President of Cannabis Merchant Financial Solutions, Inc.
"We're pleased to have entered into an agreement with Chongson and look forward to working alongside Mr. Tommy Chong and his team in bringing the Tommy Chong Cannabis GreenCard to market," commented Mr. Henry Fong, President and CEO of FastFunds Financial Corporation. The Company believes that recurring revenues can be derived from its ownership in Cannabis Merchant Financial Solutions, Inc. and the Tommy Chong branded Cannabis GreenCard product. Given the numerous transactions that take place within the cannabis industry within retail environments on a daily basis, processing fees are expected to cumulatively multiply as the industry itself grows and matures. Additional information will be released to shareholders of the Company pertaining to this development in the coming weeks. FastFunds Financial Corporation ("FastFunds" or the "Company") is a holding company that is publicly traded on the OTC Pink exchange, under the symbol "FFFC." Through its wholly-owned subsidiaries, Cannabis Angel, Inc. and The 420 Development Corporation, the Company is focused on acquiring and building a portfolio of revenue producing companies that provide ancillary services to the cannabis industry. FastFunds does not engage in activities that violate Federal laws. As we 'predicted?' yesterday, Tommy Chong and Peta were voted off of ABC-TV's Dancing with the Stars. Tom Bergeron said that of all the contestants this season, he was most looking forward to Chong. Vote for Tommy Chong on ABC-TV's Dancing with the Stars. Use each of these methods so we can get him to next week. Tommy Chong will at Gotham Comedy Club in New York City this Thursday hosting Gotham Comedy Live. Can't get to New York? Don't worry, it will be broadcast live on AXS-TV (which I believe is only on Fios). Tommy will already be in town because the script says he's 'scheduled' to be voted off of ABC-TV's Dancing with the Stars Monday night. The voted off contestant comes to Good Morning America the following morning. Legendary writer/actor/comedian Tommy Chong of the Grammy Award-winning comedic duo Cheech & Chong, and 2014 competitor in ABC’s Dancing with the Stars has inked his first-ever international co-branding deal with Europe’s top purveyor of roll-your-own smoke accessories, Futurola, to introduce premium Dutch rolling equipment to the expanding U.S. market. Headquartered in “the smoker’s capital of the world,” Amsterdam, Netherlands, Futurola opened its first U.S. branch office in early 2014 to bring its line of high-quality smoke accessories to legal medical marijuana patients and American smoke enthusiasts nationwide. The collaboration, which unites Europe’s top brand of smoker’s equipment with America’s most famous toker, will feature a co-branded collection of roll-your-own essentials including fine, handcrafted rolling papers, herb grinders and Futurola’s patented rolling machine -- the only device on the market which rolls cone-shaped cigarettes, the preferred style in Dutch coffee shop culture. Futurola’s exclusive line of Tommy Chong smoke accessories are expected to begin hitting medical marijuana dispensaries and smoke shops in both Europe and the U.S. as early as November, coinciding with a special promotional event showcasing the collection at the 2014 High Times Cannabis Cup in Amsterdam, November 23-27, 2014. Chong fans with plans to be in Amsterdam on November 29, 2014 are invited to enter a special contest to get “Lifted and Drifted” with Tommy Chong. Grand prize winner will attend a private dinner aboard a boat through the Amsterdam canals to a coffee shop for a chance to smoke with Tommy Chong. Ten runners up will receive a premium gift box from Futurola. Follow @FuturolaUSA on all social media or visit http://www.futurolaUSA.com for information on how to enter. Iconic actor, best-selling author, and Grammy Award-winning comedian Tommy Chong is perhaps best known as one-half of the legendary cannabis-fueled comedy duo Cheech & Chong which minted six gold records and released eight films during their reign, for which Chong also co-wrote and directed. Chong went on to star in several films and television shows, including his regular character, “Leo” on the popular series, “That 70s Show.” In addition to entertaining audiences everywhere with his unique brand of comedy, Chong is a passionate advocate for cannabis freedom. Tommy Chong was hysterical last night. After his second dance, he was asked how it was dancing with the two girls. He said it was "very hard." This isn't the first time Tommy slipped a sexually suggestive comment by the censors. A few weeks ago, he said that after his dance, there wasn't a dry seat in the house. Great news. Tommy Chong and Peta received so many votes that they're safe until next week on ABC-TV's Dancing with the Stars. Don't get too comfortable. They need your votes for next week. Vote as many times as they allow via the methods below. He barely survived last week with his leg injury on ABC-TV's Dancing with the Stars. Let's get him to next week. 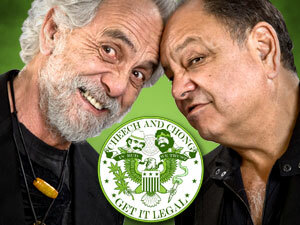 Cheech and Chong have started announcing their 2015 tour dates. On January 23rd, the Cheech and Chong Up in Smoke tour featuring WAR is coming to the Duluth Entertainment Convention Center Auditorium in Duluth, Minnesota. Tickets go on sale next Friday, November 14th via the ticket link above. On January 22nd, the Cheech and Chong Up in Smoke tour featuring WAR is coming to the Paramount Theatre in Cedar Rapids, Iowa. Tickets go on sale next Thursday, November 13th via the ticket link above. On January 24th, the Cheech and Chong Up in Smoke tour featuring WAR is coming to the Bismarck Event Center in Bismarck, North Dakota. Tickets go on sale next Thursday, November 18th via the ticket link above. Tommy Chong and Peta survived another week at Dancing with the Stars. Tommy has a huge fan base. Thanks to everyone for voting. Keep voting now for next week. ABC's Dancing with the Stars was really funny tonight. After Tommy and Peta finished their dance, Len Goodman said "Tommy, you're like a hot dog. Tastes great, but there are questions about the content." Tommy hurt his calf during rehearsal and said he "can't take his favorite painkillers." Erin pretended like she didn't know what he was talking about.